Since the U.S. Constitution was signed by a majority of convention delegates on this day in 1787, I wanted to share a QSL I created in 1988 to commemorate the constitution’s bicentennial as law of the land. That year, the FCC allowed ham stations to replace the number in their calls with “200” if they wanted to celebrate the event. My friend Bill Ronay, KM4LS, commissioned me to illustrate this special QSL for the Atlanta Radio Club. Not only did I draw the cartoon (love that brick-size handi-talkie! ), but I also hand-lettered everything, including the report form on the back. 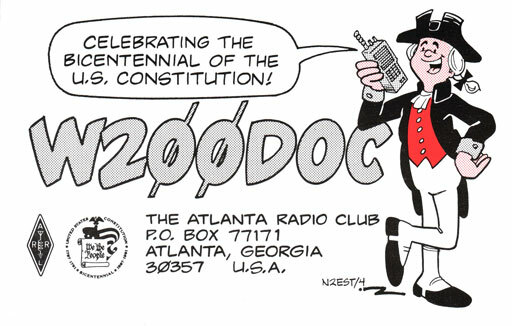 This entry was posted in cartoon QSLs and tagged amateur radio, Atlanta Radio Club, cartoon QSL, ham radio cartoon, ham radio humor, Hamtoons, N2EST, QSL, special event station, U.S. Constitution, W200DOC, W4DOC. Bookmark the permalink.